In a previous post, we introduced the help tools included in the COMSOL Multiphysics® software. 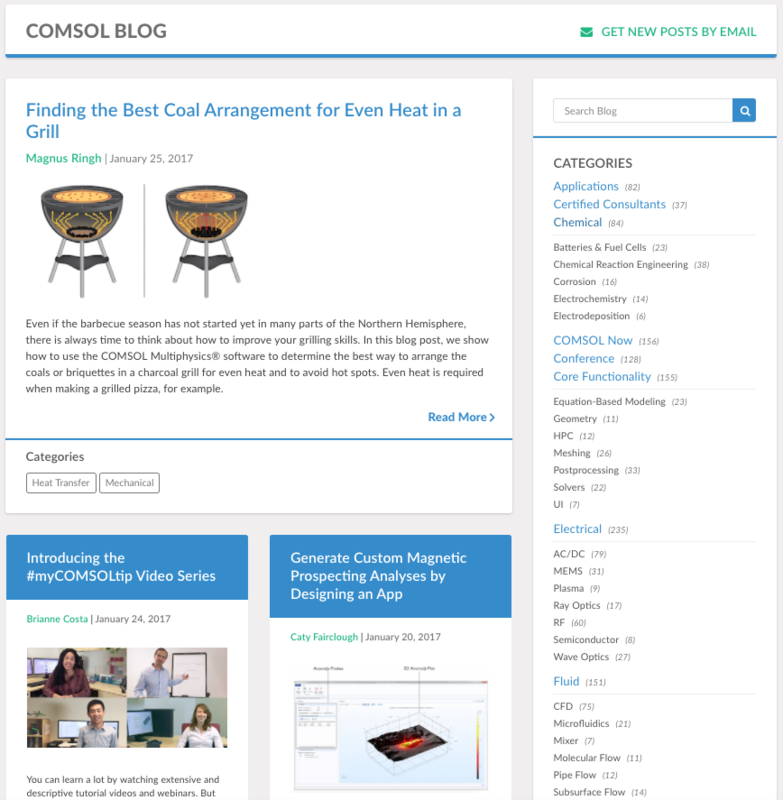 You can access additional resources on the COMSOL website, including the COMSOL Blog, Video Gallery, Application Gallery, Discussion Forum, Model Exchange, and Support Knowledge Base. 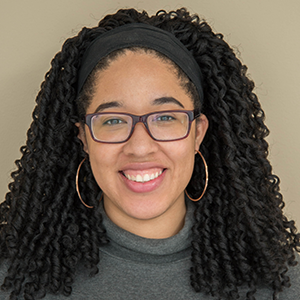 In this blog post, we discuss these resources and point you to a video that shows how to use these tools for software and modeling guidance. If you are reading this post, you most likely already know how useful of a resource the COMSOL Blog can be. If this happens to be your first visit and you are a new reader, welcome to the blog! 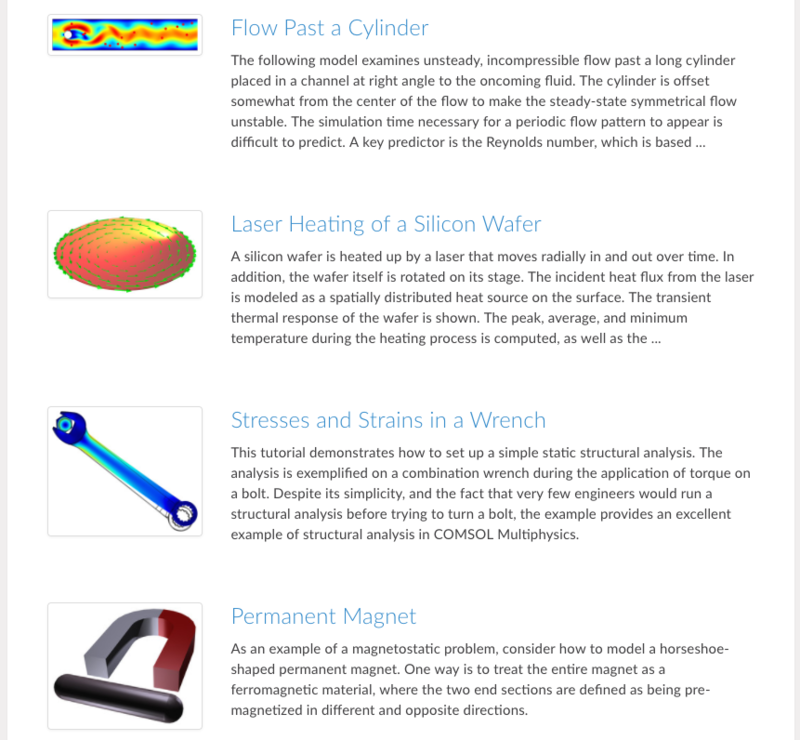 Whether you are a new user of COMSOL Multiphysics, are familiar with the software, or are looking for more information on multiphysics modeling and simulation, the COMSOL Blog contains a plethora of content that caters to your needs. We publish new blog posts here multiple times per week. These posts cover a wide variety of topics, from the COMSOL® software to interesting news in the science and engineering community. We have covered frequently asked questions from COMSOL Multiphysics users, modeling strategies for different types of physics, how industry leaders use multiphysics simulation for innovative product development, and even the science and physics behind effects observed in the real world. On the top-right corner of this (and any other) blog post, you can click on the Get New Posts by Email button to subscribe to the blog. This enables you to stay up to date with every new post. We encourage you to discuss the information you find on the blog with colleagues and peers by using the Comment section found at the bottom of every post. Note that you will need a COMSOL Access account to post a comment. Post a comment sharing your thoughts about the blog post. 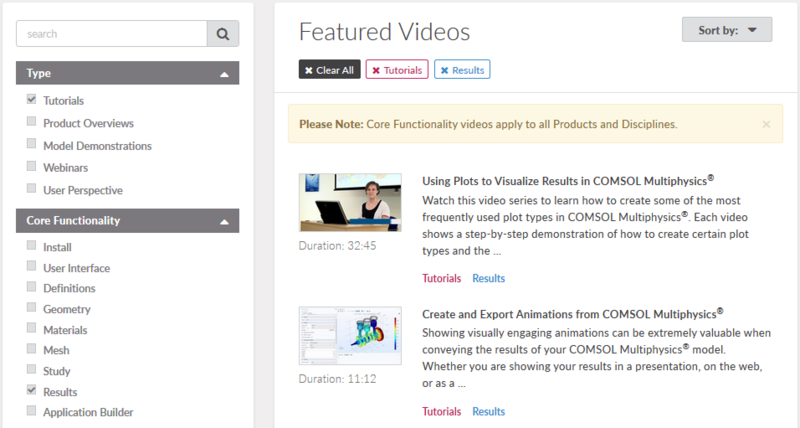 Another valuable resource on our website is the COMSOL Video Gallery, which includes over 200 videos. Similar to the blog, this space is also updated with new content on a regular basis. These videos are especially helpful if you happen to be a visual learner. Many of the videos in the Video Gallery can also be viewed on the COMSOL YouTube channel. There are several types of videos in the Video Gallery that serve different purposes, the most prominent being instruction. These videos include tutorials, model demonstrations, and archived webinars. Our tutorials, both individual videos and tutorial series, cover core functionality topics and modeling processes — many of which are applicable regardless of your field. Model demonstration videos offer a broader overview of simulation for certain application areas and show how easy it is in the COMSOL® software. Archived webinar videos feature recordings of previously aired online seminars conducted by COMSOL staff and include a software demonstration. A small portion of the Video Gallery, featuring some of our postprocessing tutorial videos. Product overview videos, also available to watch in the Video Gallery, teach you about the products we offer and special features of the add-on modules. While product overview videos inform you of the potential of what you can do in the software, the user perspective videos show you how other people use it. These videos highlight the breadth and depth with which COMSOL® software users combine their knowledge and expertise with the power of multiphysics simulation to further innovate technology and product development. Just as the COMSOL Blog is a great place to learn by reading and the Video Gallery is a great place to learn by watching, the Application Gallery enables you to learn through practice. This part of the website contains over 800 models, spanning every engineering discipline and industry. Whether you are developing an electrical, mechanical, fluid flow, heat transfer, or chemical application, you can search the gallery and find relevant tutorial models. Examples of tutorial models included in the Application Gallery. Besides downloading these models, you can also access accompanying documentation that provides detailed background context and insight. By logging into your COMSOL Access account, you can download model files and documentation from the Application Gallery. Many of the tutorials and demo apps in the Application Gallery can also be found directly in the product via the Application Library. As a follow-up to how the Application Gallery fosters learning through practice, the Discussion Forum provides a space where you can connect with other COMSOL Multiphysics users and get their insight on various topics. The forum is a place to communicate with other software users in the multiphysics simulation community regarding topics of interest, formulating problems, new and alternative modeling approaches, modeling challenges, and other modeling and simulation topics. Whatever the case or question may be, this platform serves as a great place for you to discuss ideas with peers. Although you are free to view and read through forum threads and posts, in order to take part in the conversation, you need to log into your COMSOL Access account. The Model Exchange is another community-oriented outlet where COMSOL Multiphysics users can share and exchange ideas. Through this platform, you can share models and papers as well as access those created by other users. Similar to the blog, each entry can be discussed through the Comment section on the page. Again, if you are logged into your COMSOL Access account, you can download entries or post comments. Another resource available online through the COMSOL website is the Support Knowledge Base. This space contains solutions, background information, and examples for FAQs about the software. These topics include, for instance, issues when installing a COMSOL® product, how to reference the simulation software in research papers and publications, and error messages while working in the software. Whatever your preferred learning style — whether it’s reading, watching, practicing, or discussing — we try to provide you with resources that cater to your needs. Next, watch a tutorial video to see how to access each resource on the COMSOL website and learn how they can be useful to you. As we mentioned earlier, although you are free to search and view all of the above resources, we encourage you to create a COMSOL Access account. This will enable you to take full advantage of all that they have to offer. To create an account, you can go to the COMSOL Access page. Then, join the discussion below! What is your favorite COMSOL resource to use? hi. I want to simulate the two-compressible flow in gas- liquid interface with ultrasound impact with the fluid free surface. how I can do it with comsol ? is it possible ?. Hi Medhi, for more specific modeling questions such as yours, it would be best to contact your local COMSOL Support team. You can do so here: http://www.comsol.com/support.